Because we track patterns in culture, we recognized — and coined — the emerging generation you now know as Gen Z.
Millennials have been described as the most analyzed generation, but we shifted the spotlight to Gen Z. Born in 1998 and after, Gen Z know the world could change in an instant. They’re saving and planning for a paycheck later. Witnessing their millennial siblings flail, Gen Z have resolved to do things differently. Intrigued and challenged, they’re constantly searching for ways to hack life and work. Resourceful, creative, humble — and always connected — Gen Z possess the inner engines of a startup. With $44B in buying power, they are the financial influencers of the future. And if it doesn’t work, Gen Z will want to fix it. We’ve helped some of the biggest brands in the world be relevant for Gen Z. How can I be relevant to my next generation of Gen Z consumers? Why does pragmatic purpose matter so much to Gen Z? What does inspiration mean for Gen Z? What does “being woke” matter to Gen Z and their food? What does privacy mean for Gen Z? Over the last six years, our research has put Gen Z on the cultural map. We were there in the beginning, and we’re still here today. 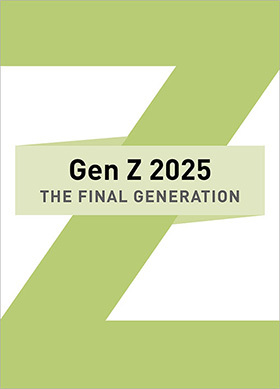 Download our groundbreaking Gen Z 2025: The Final Generation report here. In 2014, our work on Gen Z introduced the world to this new generation with Meet Generation Z: Forget Everything You Learned About Millennials. In 2015, we delved deeper into the behaviors and attitudes of Gen Z with our groundbreaking Culture Forecast report, Gen Z 2025: The Final Generation, covered in The New York Times in Move Over Millennials, Here Comes Generation Z, and many media since. Our Gen Z research has shaped influential headlines, books, conferences and keynotes, including those at NFL and RedBull, among others. We’ve helped industries, tastemakers and organizations understand and engage Gen Z ever since, and we continue on that journey at sparks & honey every day. From our Gen Z collaborators to our Advisory Board and global network of scouts, our eyes and ears are on the ground with Gen Z. Primary research from our groundbreaking Gen Z 2025 report, featuring interviews with Gen Zers around the world. We gathered a panel of lively Gen Zers and industry experts to discuss everything from diversity to politics and privacy in the age of social media with this budding generation. Livestreamed on Facebook, this Special Edition: Gen Z briefing has reached some 36,000 curious minds to date. Millennials have been described as the most analyzed generation, but our research over the last six years shifted the spotlight to Gen Z. Building on that research, we hosted a special culture briefing live-streamed on Facebook. Special guests of all ages, from Gen Z to industry leaders, convened to discuss topics including politics, diversity, how the constantly connected keep some semblance of privacy in the age of social media, and what makes a brand relevant to Gen Z. Read the full story here on Medium. Make your organization Gen Z ready.